To improve the experience for runners, walkers, and bikers, seven miles of the 18 mile path will be repaved, and investments will be made to separate runners from bikers from Fullerton to Ohio and from 31st to 51st Streets. 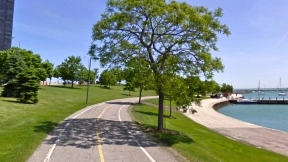 Additional gathering and recreational spaces will be created, including gathering spaces in the Burnham Wildlife Corridor, rebuilt and new pedestrian and vehicular bridges at 35th, Oakwood, 41st and 43rd, a pool and event space at 31st Street Beach Harbor and a triathlon training space at Ohio Street Beach. Projects will include the expansion of the stadium at Devon and Kedzie, the expansion of the Riverwalk through development projects in the South Loop from Harrison to Roosevelt, the opening of the Eleanor Boathouse in Bridgeport, the connection of Pilsen and Little Village through a rails to trails project called the Paseo, and the construction of two bike/pedestrian bridges, Riverview Bridge at Addison, a modern, pedestrian-only bridge connecting the river east edge with the west in Albany Park and a bike/pedestrian bridge at Irving park that passes under the street at Horner Park allowing bikers, runners and walkers to avoid traffic. Building on Burnham will take this expansion of natural areas to the next level, setting the goal of 2,020 acres of protected natural areas in the City of Chicago by 2020. For more information about the Chicago Park District, visit www.chicagoparkdistrict.com or call 312.742.PLAY, 312.747.2001 (TTY).